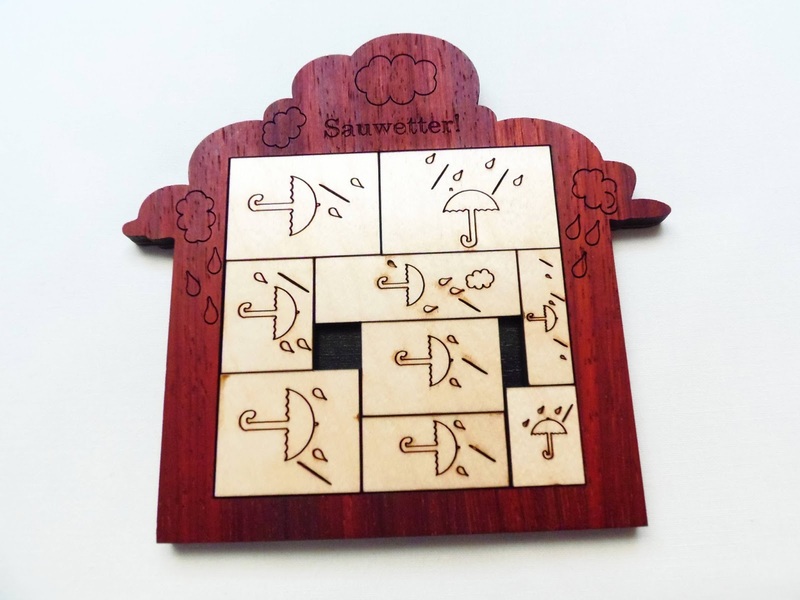 The Cross-Puzzle comes from the German manufacturer Philos, which has a large variety of wooden puzzles, chief among them a nice selection of interlocking ones, like the one above. The puzzle consists of 9 pieces interlocked in groups of three. You need to take it apart and reassembling it to fully solve it. The design itself, more specifically the cross shape, has been used in several different interlocking puzzles before, but the actual concept of interlocking groups of three pieces is kind of clever and a novelty, at least for me. The puzzle would be too simple if each of the three groups had the same orientation for its pieces. However, when you first try to take it apart you'll be surprised by how the pieces actually interact with each other. Each group has three pieces, like I mentioned above, and one of them has twice the thickness of the other two, so in fact it looks like each group carries four pieces instead of three. Another interesting feature is that one of the pieces slides out on the opposite side of the other two (as seen below). The construction of the puzzle, unfortunately, is not as perfect as others in the Philos range. 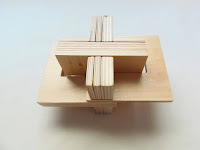 The wood is made from several layers glued together and seems low quality, apparent by the way the pieces connect, which not being perfect takes away some of the challenge, since you can clearly see the edges of each piece. This is not a difficult puzzle by any means. Even if it were flawless it wouldn't have been too much challenging. It's classified as a level 1/4 in the package and 7/10 by PuzzleMaster, which I tend to agree. I didn't have much trouble to take it apart, even though it took me a bit more time reassembling it. Like most interlocking puzzles, spacial awareness skills are a must and the reassembly always requites a bit more focus and dexterity. Since I've noticed the way the pieces were connected as I was taking them apart, the reassembly was relatively easier. The Cross-Puzzle is certainly a very interesting puzzle. The concept is fresh and original, but the construction could've been much better with proper wood. Nevertheless, it's worth a try if you fancy interlocking puzzles. 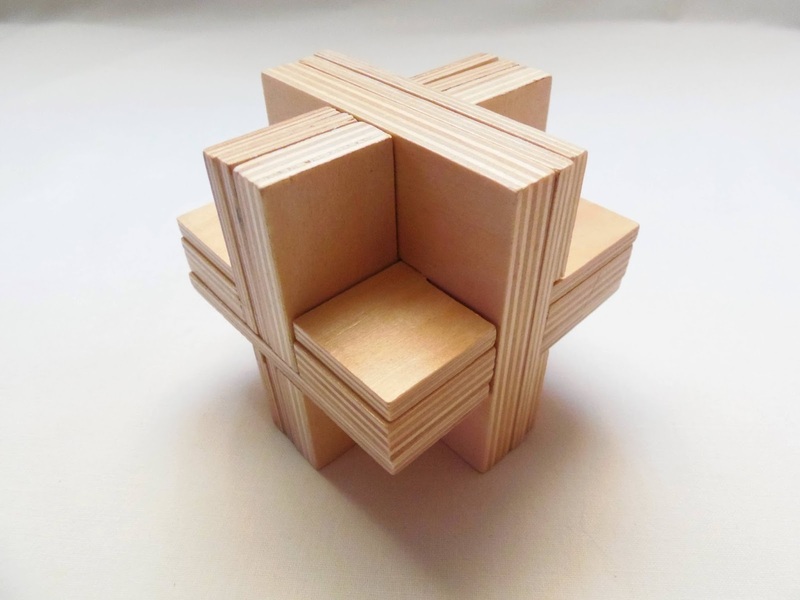 Availability: You can buy the Cross-Puzzle at PuzzleMaster for $14 CAD. Deal of the Week: This week, you can get 15% off on all Sloyd Metal Puzzles. You just need to mention the name of my blog when you place your order. Offer valid until August 2. Christmas won't be for another five months, but that didn't stop me from setting up a tree in the middle of Summer... A different kind of tree, that is. 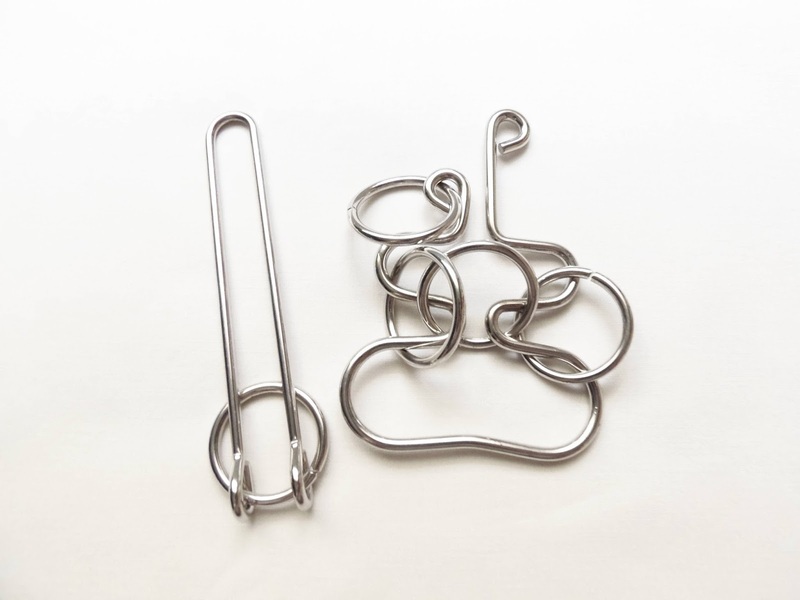 This Christmas Tree is a very nice wire puzzle manufactured by Sloyd in Finland and belongs to their Metal Puzzles range, with a wide variety of designs. Besides the design variety, Sloyd's metal puzzles also have different levels of difficulty, ranging from very easy to extremely frustrating. The Christmas Tree, however, is easy to "set up" while still providing a nice challenge. 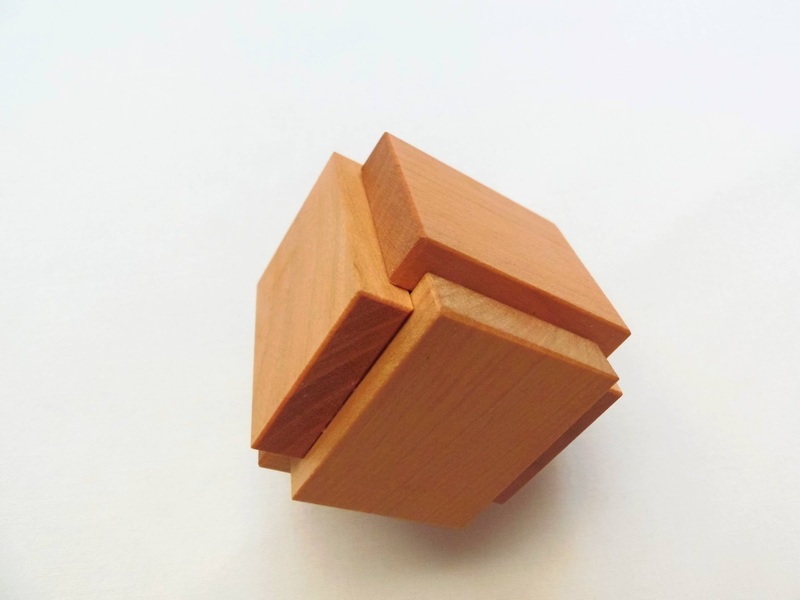 With a difficulty level of 2/5, experienced puzzlers might be able to solve this within a minute or two, whereas a beginner might take up to half an hour or even more. I fall in between the two extremes, as I took about 10 minutes to solve it. The hard part with these puzzles is that even after you can visualize the exit point it can be whole other matter to get there. The goal of the puzzle is simple enough for anyone to understand, even for someone that never solved one of these before. There are two basic pieces, the main body in a tree-shape and a handle. The object is to free the handle from the tree and then, put it back in its original position. It might be easier said than done, since it took me a while to fully understand the solution and be able to do it back and forth between its two states. Once I figured it out, I could do it in three easy steps within a few seconds. It's actually quite rewarding when you manage to understand the solution and be able to solve it fast enough to dazzle your friends and family. 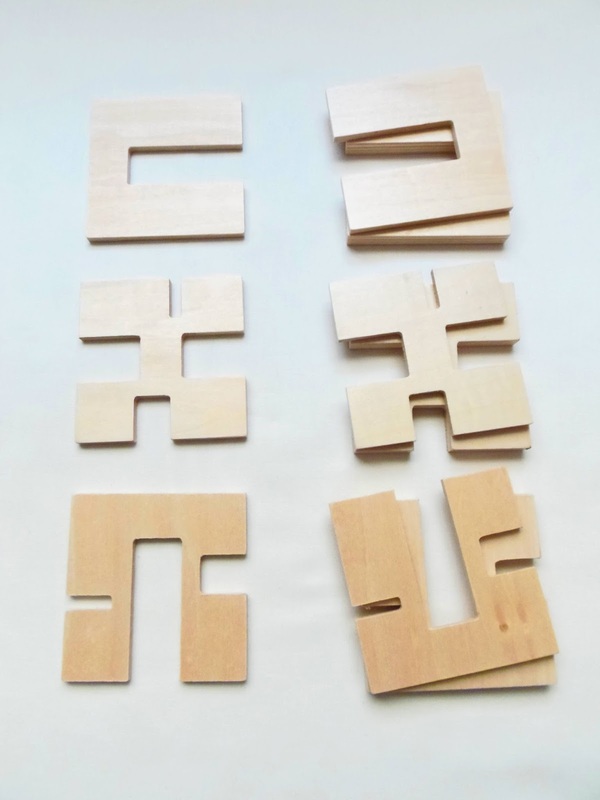 The design of the puzzle is somewhat symmetrical, meaning you can solve it by using one of the two sides. 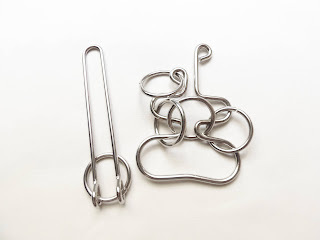 In other words, and looking at the puzzle with the tips facing upwards, you can manipulate the handle on either side and still be able to solve it the same way. The side with the ring attached to one of the tips might be a bit trickier to use, since it's harder to make the handle pass over it. On the other hand, the opposite side is less complex, as you only have to worry about two of the three middle rings for the solution. The Christmas Tree is a step up in difficulty from the previous Sloyd metal puzzle I reviewed, The Triangle Tie. If you're just starting with these puzzles, I recommend starting with the level 1/5 and work your way up. The Tree feels a little more challenging, although it's still far from being frustrating, even for beginners. Definitely worth a try. Availability: You can find The Christmas Tree and others in the Sloyd Metal Puzzles range at Sloyd.fi. This week you can enjoy a 15% discount on all Sloyd Metal Puzzles. To benefit from the discount you only need to mention my blog when you place your order. Offer valid until August 2. 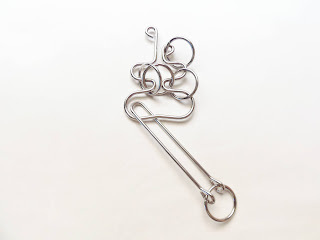 Trick Lock puzzles are so abundant and varied in their designs that it's hard to keep up by just being aware of their existence, much else purchase all of them. 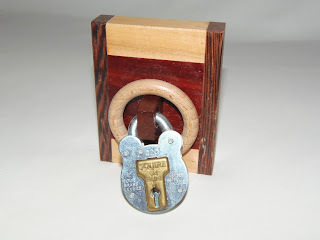 I have several of these lock puzzles in my collection, and even though it's lacking the presence of the fancier and more expensive designs, like the Popplocks, I'm still proud to own a nice selection of them. I've recently added another interesting design to my Trick Lock collection, by Vesa Timonen, the Lock Puzzle - Could have had a better name though. This would've been a brilliant puzzle if not by the lack of quality Bits and Pieces puts in all their puzzles. I've reviewed several puzzles from them before and every single one has multiple flaws. This is truly sad for the designers, who envisioned their creations in one way, but the final product doesn't correspond to what they had in mind. The puzzle is built from a plated nickel alloy, which is not the best choice if you want your puzzle with a clean and smooth look. It's also quite small actually, measuring only 4.3 x 4.2cm (1.69" x 1.65"), but it's still heavy considering its size and fits comfortably in your hands. The Lock Puzzle has a very intriguing mechanism, which again, is almost ruined by its low quality. The pieces are somewhat loose and shouldn't move so freely, because it will easily reveal the inner mechanism that should have been hidden in the first place. 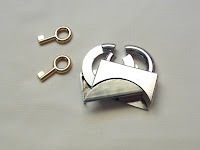 The idea of the puzzle is to free the two keys from the lock, and even without the puzzle in front of you, you can easily see that the keys are not the "key" to solve the puzzle. 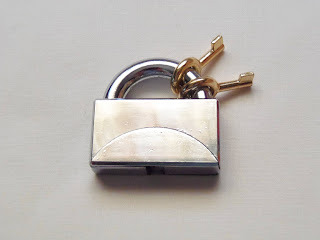 If you press both sides on the bottom of the lock, you'll notice that it tries to open itself in half, but the keys maintain it from doing so. You just need to figure out the way to make the keys unlock the mechanism. 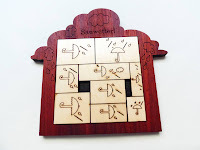 PuzzleMaster has rated the puzzle as a level 8/10, and ideally I would agree if it was properly built, but seeing how the puzzle was put together and how easy it was to figure out its mechanism, I would only rate it as a level 6. I managed to solve it within a couple of minutes, which for a Trick Lock is rather disappointing, as I expected it to be much more challenging than that. Reassembling it wasn't difficult, but required a bit of dexterity to get the pieces where they belonged. All in all, a very interesting puzzle that turned out to be very easy to solve due to its lack of quality. 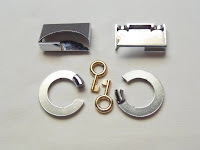 Vesa's design is quite original for a Trick Lock, and that's why I was interested in trying it, even though I knew what I was getting into by ordering a Bits and Pieces puzzle. It's a great design, but with poor execution. If you're interested in getting one, just don't expect a great quality and enjoy the puzzle purely for its mechanism. The mechanism itself is what makes the puzzle so interesting and even with all its flaws, I think it's worth a try. Availability: You can buy the Lock Puzzle at PuzzleMaster for $10 CAD. You can check out other Trick Locks here. It's hard not to think about great puzzles and games when Oskar van Deventer is mentioned. This prolific Dutch puzzle designer invents puzzles faster than you can solve them, and my only guess is that his day is longer than 24 hours, as I can't fathom how he can find time to create so many puzzles. Great ones, I might add. Back in 2008, Oskar's contribution to the vast catalog of SmartGames was the Anti-Virus, which is one of the few not invented by Raf Peeters, SmartGames' resident designer. Anti-Virus could be described as a fancy version of Rush Hour, since both concepts are based on getting pieces out of the way and free the main piece, but in reality, Oskar's game is much more than that. It excels in every way on how a multi-challenge game should be done. The result is a gorgeous, vibrant and colorful game, very addicting, and above all, quite challenging, which is a rare thing in this type of games. The goal of the Anti-Virus is to get rid of the "virus", the red piece, by sliding your "immune system", the other colorful pieces, diagonally on the board. You solve a puzzle when you can successfully slide the red piece out of the exit point located in the board's edge. It won't always be that simple, since the path to free the red piece will be blocked by the other pieces and the diagonal movements aren't always as intuitive as the ones you can do in Rush Hour, for example. This is what makes the concept so different, challenging and addictive at the same time. There are 11 pieces in total, although two of them are single white units, placed on the board to make your task of sliding the pieces much harder. The other nine pieces can be divided in six different groups with three of them being unique. The challenges won't use all of the pieces at once, but they are varied enough to include a different number of them in each puzzle. The game has a good progress in terms of difficulty as well, starting with the "Starter" level and going all the way up to "Wizard" in five different levels and 60 challenges. Unlike many puzzle games I've tried, the Anti-Virus game can be really challenging once you reach the last difficulty level. Some of those puzzles required me to reset the board a few times and start over before being able to finally solve them. All puzzles are provided with solutions, but use them as a last resort only, because it's much more satisfying and rewarding solving a tough puzzle by yourself. Once again, Oskar delivers us a masterpiece in the form of a puzzle game, not so common in his designs, but probably one of his best creations, and definitely my favorite game from SmartGames. What else is there to say? - If you love challenging puzzle games and still don't have this one you owe it to yourself to add it to your collection. Availability: You can find the Anti-Virus puzzle game at Sloyd.fi for about €25. The latest addition to my collection is the E Box, a three-piece puzzle where the goal is to take it apart and reassemble it back to its original cubic form. Vinco always uses high-quality wood in his puzzles and this one is no exception. It's also surprisingly small, measuring only 5cm in diameter (2"). Nevertheless, it won't be because of its size you'll have trouble solving it. The outside of the puzzle, for someone that doesn't know Vinco's puzzles very well, looks like a three-piece Burr puzzle, which would have a completely different way of solving it. By knowing Vinco's work, however, you already know what to expect and as such, the solving process takes a little less longer. You still need to find the correct way to separate the pieces, though, and since you're working with a coordinate-motion puzzle you'll need to do it simultaneously for all three pieces. The difficulty of the puzzle is not very high, but still tricky especially in the reassembling process. Vinco has a rating of 3/5 and PuzzleMaster classifies it as a level 8/10. I don't think it's that challenging though, but then again, I already solved quite a few similar ones from Vinco, so this might have helped me a little. When you pick up the puzzle for the first time you'll hear a rattle inside indicating there's something loose inside. That's actually a small sphere put there to add a little extra challenge for the reassembly. When you try to put the pieces back together you'll need to put the sphere back in before sliding the pieces all the way in. There's only a small window of space where you can do this, and taking into account that it takes a bit of dexterity to align the three pieces so they slide all together, it can take you a few extra attempts. Like always, it's a pleasure to add a Vinco puzzle to my collection. Even though he mostly uses the same mechanism, his designs are quite diverse and use a lot of different wood types and color tones. It'll be a long while before you can say you have all of his distinct designs. The E Box is an excellent choice if you're just starting with coordinate-motion puzzles. I'm sure it won't be your last coordinate-motion puzzle or Vinco puzzle. Availability: You can get a copy of the E Box at PuzzleMaster for $16 CAD. For other Vinco puzzles, you can browse their dedicated Vinco page with a wide variety of designs. Something I've noticed with Jean Claude Constantin's puzzles is that he has quite a wide variety of Trick Lock designs. 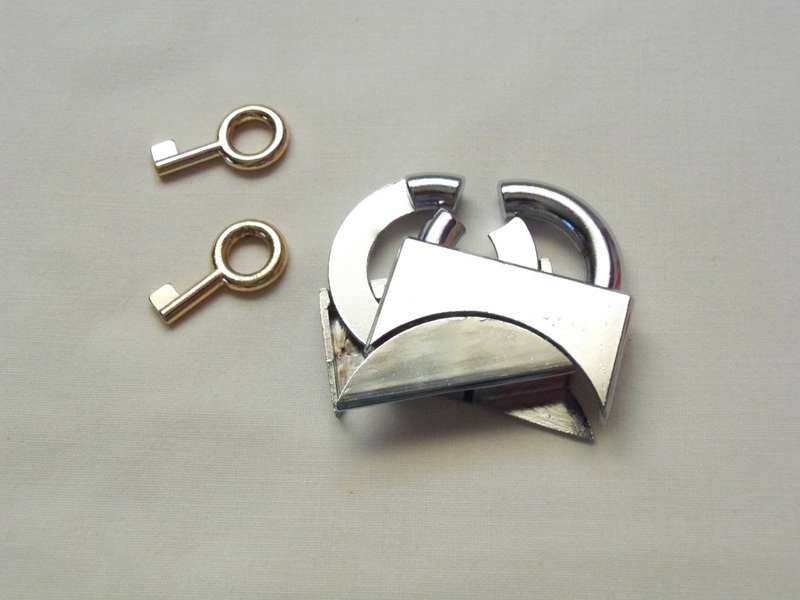 It's not hard to think why since you can get very creative when designing a Trick Lock with a hidden mechanism. If you research a little you'll see there are countless of different designs and mechanisms that will make any collector envious. The puzzle you see here is called Schloss, which can be translated from German simply as lock or castle. Maybe it's meant to represent a locked entrance door to a castle, as its design is certainly reminiscent of that. The design is quite original and counter-intuitive for beginners, and uses a few different wood types and tones in contrast with the lock itself, which appears to be relatively old, just like a castle's door lock. The puzzle is also relatively small, with the wooden block measuring about 10 x 8cm (3.9" x 3.1"). The Schloss uses a common hidden mechanism concept seen in other types of puzzles. Trick Boxes, for example. An experienced puzzler will almost immediately recognize the mechanism while others will get deceived by its design. Something you'll notice, whether you're a seasoned puzzler or a beginner, is the lack of a key to open the lock. Now, if you're not provided with a key, and before you think the puzzle is incomplete, you need to inspect the puzzle a little closer and look for other clues. You won't take long to notice a couple of subtle hints in the design that will at least give you an answer in respect of the lock itself. 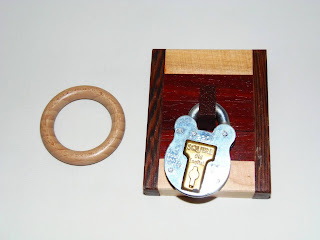 The goal is to free the wooden ring that's trapped between the lock and the block. How you do that it's up to you to find out, but I guarantee you'll crack a smile when you eventually solve it. As a collector and a fan of Constantin's puzzles with an interest of Trick Locks, the Schloss is a must-have in any collection, but in terms of actual puzzling, if you're an experienced puzzler, you won't find it remotely challenging. As I mentioned above, the mechanism is easily recognizable as soon as you take a closer look and after that it's solved in a matter of seconds. If I had to choose a classification level I'd have to give it two ratings depending on the person that'd be solving it. One for experts, which would be about 5/10, and one for beginners, which would be around 7-8/10. Nevertheless, whichever group you fit into, I reckon you'll love the Schloss. I found the Schloss rather easy to solve, but even so, and as a puzzle collector, I was quite satisfied to add it to my collection. I do recommend showing it to your friends, co-workers or family members, as it will certainly amuse you how others will try and solve it and ask you questions about missing parts. Availability: The Schloss is available at Sloyd.fi for €24.70. 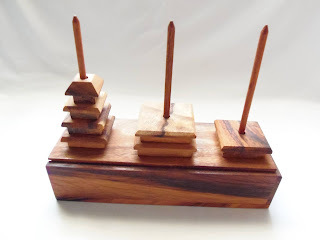 If you're a puzzle collector or simply like to play with mechanical puzzles you've probably seen one of the many versions of a Tower of Hanoi. A classic mathematical puzzle first introduced in the west in the 19th century, but believed to have much older roots. The version you see here, in a chedi style, is one the best looking I've seen in a while. This gorgeous version is perhaps inspired by the legend of the Tower of Hanoi origin, which locates it from an Indian temple in Kashi Vishwanath. The puzzle is a representation of a 7-tier pagoda, very well built in hardwood and quite large, which is very nice for a beautiful puzzle like this. The closed box dimensions are 24 x 9 x 6cm (9.5" x 3.5" x 2.4"). 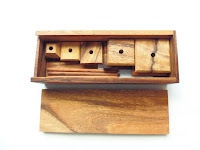 The box is ideal to store the pieces and the lid slides open very easily. I'm not sure of the treatment this wood takes, but I got to say, it smells wonderful. You have to really experience it to know what I'm talking about. You start with all seven rings at the central pole. The idea is to transfer all rings to one of the other two poles in the same order. You can only move one ring at a time, taking always the upper ring from one of the three poles. Depending on the number of disks or rings, the minimum number of moves will also vary. taking into account the formula 2n - 1, where n is the number of rings, we can calculate the minimum number of moves for this 7-ring version which is 127. If we were to add just one more ring to the puzzle the total number of movements would basically double to 255. With nine rings it would take 511 moves, and so on and so forth if you were to continue adding more rings. The Tower of Hanoi is probably one of the first n-ary puzzles in the world, more specifically binary or 2-ary. There's a whole page dedicated to these puzzles by Goetz Schwandtner, which is totally worth taking a look. I should warn you that these puzzles are extremely addictive and for a collector, who aims at having a more complete and comprehensive collection, it's a bit dangerous to look at all these magnificent puzzles. 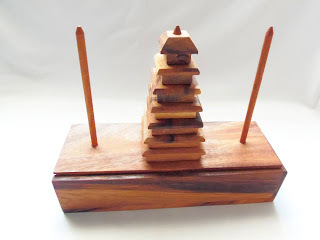 I absolutely loved the chedi version of the Tower of Hanoi. 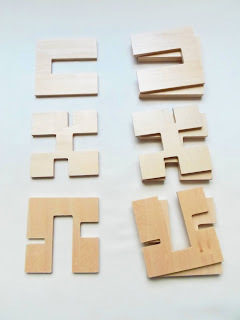 The design and presentation of the puzzle is magnificent and it's built in high-quality wood. If you happen to already own a Tower of Hanoi in your collection, do yourself a favor and add this one to it as well. It's a beautiful collective item or simply used as a display object in your office or living room. Availability: You can find the Tower of Hanoi - Chedi at Brilliant Puzzles for $17.95. For this puzzle, it's a bargain. Sauwetter! 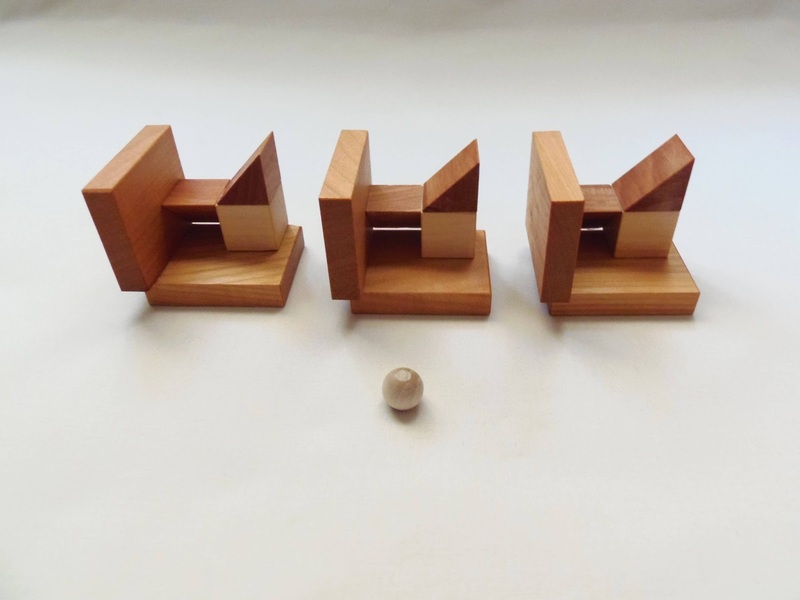 is yet another original puzzle from Jean Claude Constantin. 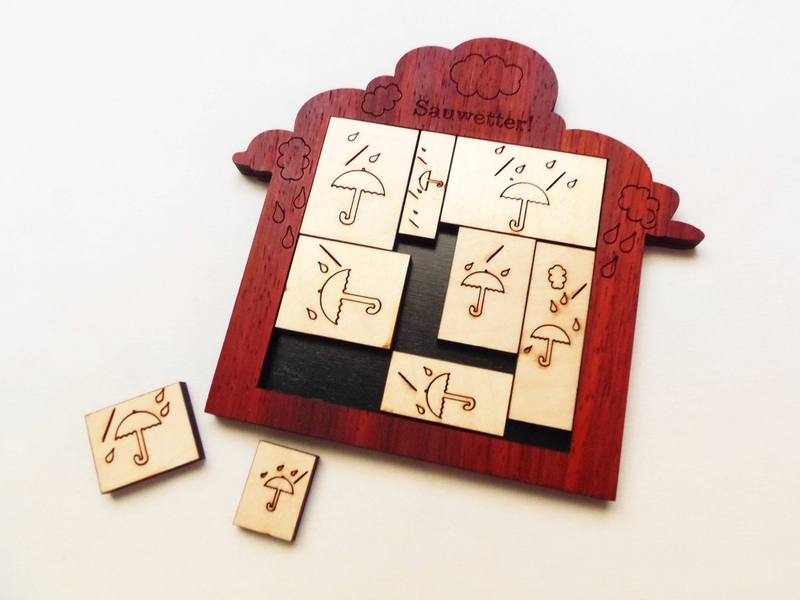 Roughly translated as "awful weather", the concept doesn't bring anything new to the Packing Puzzles family, but the presentation, like all Constantin's puzzles, is something out of the ordinary. So, a simple concept of packing pieces into a frame becomes this beautiful object any puzzle collector would be proud to own. The puzzle is comprised of 9 distinct pieces with different dimensions that need to be all neatly packed inside the board. Each piece is individually engraved with a slightly different umbrella pattern. 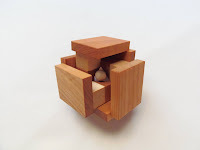 When solved, the orientation of the pieces is not important. The puzzle's picture on PuzzleMaster's website shows the opposite colors of mine, dark pieces on light board. If colors are important to you, make sure you specify which version you'd like before placing your order. It's not a big puzzle, but for a packing puzzle it has the ideal dimensions with 14.5 x 13.5cm (5.7" x 5.3"). This concept reminds me of the Calibron 12 puzzle, where you also needed to pack rectangular pieces inside a frame. There's a big difference between the two, though... Difficulty. One is almost impossible to solve without a careful mathematical analysis. The other, the one you see here, is easily solvable within 10-20 minutes. The PuzzleMaster's difficulty rating of 7/10 also denotes a tricky but not frustrating challenge, unlike the Calibron 12. 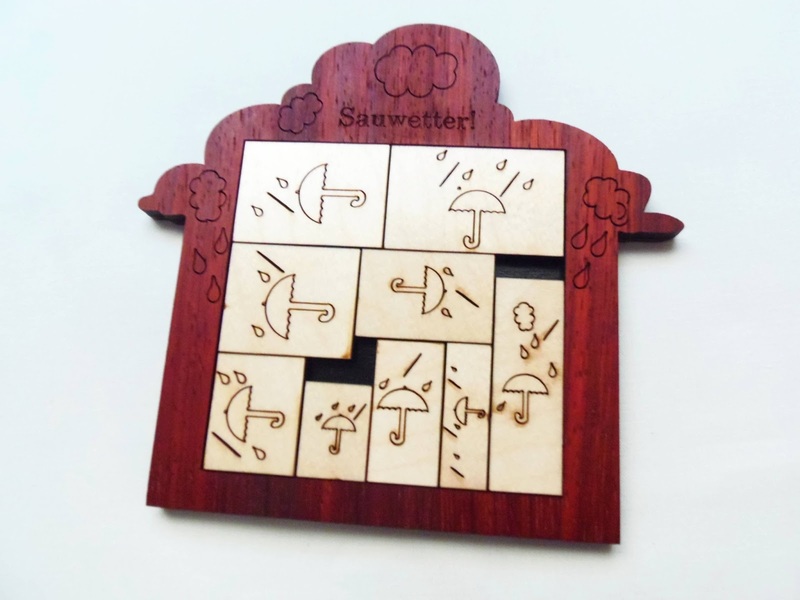 Like I said, you can solve the Sauwetter! in a few minutes, depending on your approach. I also discovered a couple of different solutions, and it's possible it has even more. With multiple solutions the puzzle becomes significantly easier to solve, but it can also be seen as a good thing since you can attempt to find all these distinct solutions and have the puzzle around for longer, although with the Calibron you'd probably still have it around unsolved even after discovering all Sauwetter! 's solutions. EDIT: I found out a rather important thing about Sauwetter that I was unaware at the time of writing this review. Apparently, there's only one true solution, which is to pack all pieces in the tray with the same orientation, not just pack them randomly. Thank you Serhiy, for the info. With packing puzzles being among my favorites, and Constantin being my favorite puzzle designer, this is all I could ask for. 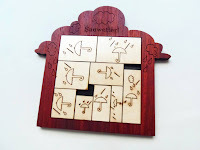 The design is gorgeous and the puzzle is not very difficult to solve. It has the right amount of challenge for a beginner, meaning you could offer it to a friend or loved one. It can be an excellent training exercise if you plan on acquiring the Calibron 12 in the future - Probably the hardest packing puzzle you'll ever try. Availability: You can get a copy of the Sauwetter! at PuzzleMaster for $20 CAD. For a wide variety of Constantin's puzzles, check out PuzzleMaster's dedicated page. 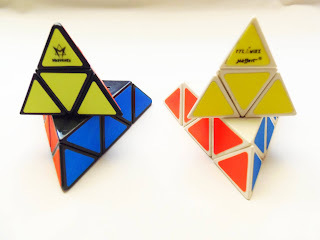 With all this popularity, it's not a surprise knowing that there are too many Pyraminx versions and variations that cannot simply be count by the fingers of your hands. My latest acquisition is a Speedcubing version of the original, which being easily one of my favorites, I couldn't let the opportunity of having a more flexible version pass. How easily is it to maneuver in comparison to the original? - The difference is astonishing. 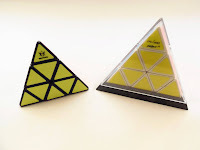 Before I get to that, a couple of differences between the two versions: the first noticeable difference is the size, as the new version is slightly smaller than the original Pyraminx, but only by a few millimeters (about half a centimeter). 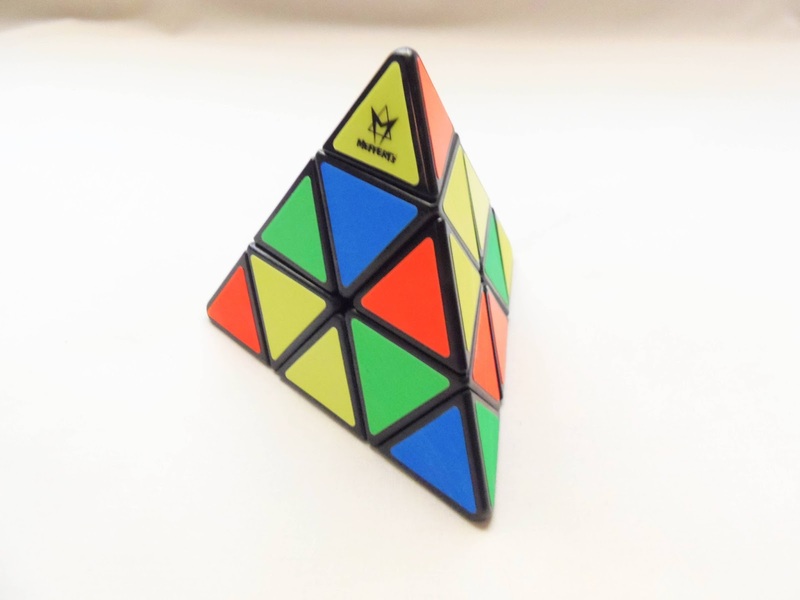 The corners of the Speedcubing version are much more rounder and feel more comfortable to handle. Another difference, and this one is purely aesthetic, is that the new version doesn't come with that nice clear display dome and stand. The main reason might be because you're gonna use it more often and it doesn't justify the extra cost for the additional parts. The stickers are basically the same color scheme, and the same high quality as all the other Meffert's products, with bright fluorescent colors. Now, the Speedcubing part... I'm probably not the best person to test this, since I'm not a speedcuber, but I did found it to be significantly better than the one I had, which by the way it's not a difficult thing, because I can barely turn it without applying too much force. I'm sure it would turn better if I applied some lubricant, but the new version is just naturally better. The puzzle has this Meffert's characteristic of turn and click, where it makes this loud noise when you complete a move. The pieces are much more loose and move effortlessly, thanks to this spring-loaded bearings. I did experience some lock-ups though. The loosely nature of the pieces is a double-edged sword, because while making them move more freely also makes them prone to jam on other adjacent pieces. You can probably lessen the effect with practice, but I doubt it will be completely lock-up free. Availability: You can get a copy of the new Pyraminx for Speed Cubing at PuzzleMaster for $18 CAD.